Happy weekend everyone! Here in the Great White North we are still waiting (and hoping) for Mother Nature to give us a break and send us spring, but today I bring you a few colours that will not only brighten up your nails, they will make you feel summer heat! Ever since my first Nubar experience last year, I have fallen in love with Nubar’s glossy lacquers. And now Nubar has introduced My Sweet Escape for spring/summer 2013, a collection of eight bright, fun and summery shades; perfect for an escape of the mind. 🙂 They are creamy brights, quite a change from the deep shades of winter, and some of the pastels we have been seeing for spring. I love the diversity of this collection, and have broken it up into two posts for you: the brights, which you will see today, and the blue/greens. The first Bright shade is Forbidden Fruit, described as nectarine by Nubar. I see it as a light burnt orange shade that reminds me of caramel. I absolutely loved this shade and its colour base. It’s so different, it’s bright, it’s orange, but it’s a subtle, wearable orange. It also applied like a dream… quick-drying on the first coat, self-levelling and even coverage on the second coat. I will be wearing this colour a lot! The next colour seemed almost like the older-sister-version of Forbidden Fruit; On The Radar is a gorgeous, gorgeous orangey-red that’s leans very red. This is such an elegant and classic shade – I refused to take it off! The application on this was perfection – it was a bit thicker than Forbidden Fruit and provided great coverage on coat one. And the SHINE!!! Is that not a beauty? Now on to the neon shades! First up is Resort Yellow, described as “lemon zest” by Nubar. What I liked about Resort Yellow was that even though I see neon yellow, it was highly wearable and a wonderful summer colour. I can see myself using this on pedis a lot this year. The formula was quite good considering my experience with neons; it was shiny, whereas most other neon-based shades I’ve worn have had a satin finish for some reason. It was a bit streaky, so I could have definitely gone for a third coat, but again, my experience with yellows has been that they tend to streak. It really does come across a lot more lemony once on and I love it! The last colour I have for you is Sour Apple, an electric lime that wanted to moonlight as Resort Yellow at first glance. I actually did a double-take when I was editing this pic below, because I momentarily thought it was yellow. It’s a very pale lime neon, highly wearable, and a little better formula than Resort Yellow, more of a crelly (cream-jelly) and you know how I adore jellies! Next time, I will bring you part 2 of my Nubar review – the blue/greens! Overall, I was once again blown away by Nubar. In my experience, their polishes have consistently delivered amazing shine and wearability, and this collection was no different. I love the variety of colours and varying levels of brightness. This collection screams summer, sun, beach, and that’s exactly what I needed. If you are looking for summer and bright colours, you need My Sweet Escape. Like all nubar products, “My Sweet Escape” Collection is free of formaldehyde, toluene, and DBP (phthalate), and is vegan and cruelty free. 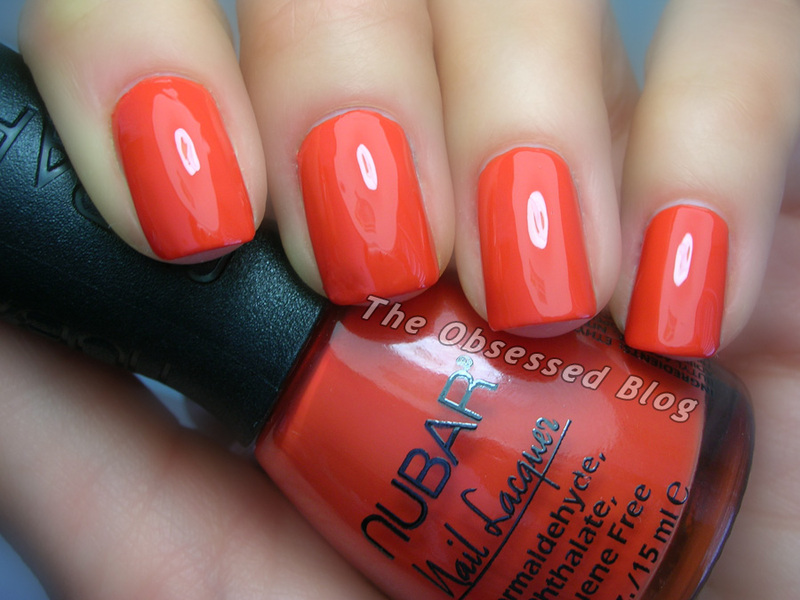 Nubar is available directly from Nubar’s online shop, from Nail Polish Canada, Harlow & Co. and other fine retailers. So which one do you like best? Lovely photos…I have not bought a new Nubar collection in about 1 yr…I think I need to look at what has come out – I sort of lost my connection that got it for me.